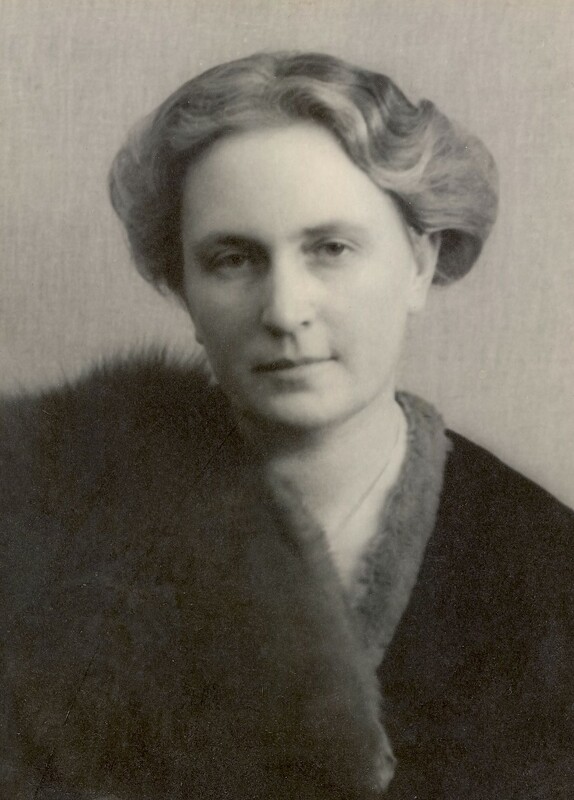 Julia Aurelius was the wife of the bishop in Linköping diocese (1927-1935). As such she set up the first meeting for wives of the clergy held by the Swedish church. She also introduced the Herrnhut (Moravian) star into Sweden, and it eventually became a nationally traditional advent star. Julia Aurelius was born in Herrnhut, Germany on the 21 October 1886. There were four children in her family. She had Swedish connections through her paternal grandmother. Her father was an architect and a construction advisor who worked with the well-known industrial Krupp family, near Essen. Julia Aurelius’ mother died when Julia and her siblings were young which resulted in Julia running the household and being responsible for the home from an early age. Both of Julia Aurelius’ parents had Moravian roots and their home bore influences of that pious tradition. Julia Aurelius had four paternal uncles, all of whom worked abroad, three of whom were missionaries. Karl Marx worked as a missionary doctor in Tibet, whilst Ludwig and Ernst Marx were missionaries in South Africa. Her uncle Gustaf had taken his Swedish mother’s surname of Dalman. Gustaf Dalman was a professor and ran the German archaeological institute in Jerusalem. In addition, he was the consul general for the city, which at the time was part of the Ottoman empire. Julia Aurelius spent part of 1910 with Gustaf Dalman and his wife in order to lend her uncle a hand with the boarding house at the institute. During the same period that Julia Aurelius was in Jerusalem Erik Aurelius, a priest and docent in exegetics, had been invited by Gustaf Dalman to spend time at the institute. Erik Aurelius had thought of Professor Gustaf Dalman as ‘a fatherly friend and patron’ since his time as a student in Leipzig towards the end of the 1890s. Erik Aurelius became professor of exegetic theology at Lund university in August 1910, and later a pastor in Husie, then Hällestad, Dalby, and Bonderup. Erik and Julia Aurelius got married in 1912, making her in one stroke both a priest’s and a professor at Lund’s wife. When she moved to Lund she brought with her a Moravian star, consisting of 18 square and 8 triangular points. These points are fastened together to create pointy cones of paper which are then attached onto a metal frame. The stars were constructed by children who boarded at the mission school in Kleinwelka near Bautzen and at the Unity of the Brethren boarding school of Niesky at Görtlitz. After 15 years in Lund Erik Aurelius was appointed bishop of Linköping diocese in 1927. As the bishop’s wife Julia Aurelius became the ‘first lady’ of the diocese. The couple quickly made friends in Linköping, including Nils and Elin Jacobsson. Nils Jacobsson had been a fellow student with Erik Aurelius and he had written his doctorate on Moravianism in Sweden. Julia Aurelius was influenced by the Moravian tradition in a number of ways. She was particularly influenced by that tradition’s radical views on gender. Women’s places and their roles within the movement were both clearly and strongly apparent, particularly during the movement’s developmental phase. As the movement took formal shape women’s roles diminished, at least within official spheres. Despite this the prominent place of women in the Moravian tradition has contributed to making the women involved in it quite independent. This was also true of Julia Aurelius. Despite her shy nature, her role as bishop’s wife meant it was expected that she would participate in various official events. In addition, she performed various of her own duties and roles. She is perhaps best remembered for, along with Elin Jacobsson, holding the first meeting of clergymans’ wives within the Swedish church. For many years the bishop of every diocese held so-called ‘clergymans’ meetings’ to which every priest was summoned. The clergymans’ wives were also invited to attend but they lacked their own forum. The wives of priests provided an incredibly important and unpaid service to the Swedish Church, not least during the 1900s when activities directed at laypeople, including children, young people, and interested locals became more common. These activities were usually dependent on the involvement of clergymans’ wives. The first of these clergymans’ wives’ meetings was held in March 1929 at the bishop’s home in Linköping. The arrangement was quickly adopted by other dioceses and various clergymans’ wives’ associations were set up, some of which are still running today (2018). It is now more common for male spouses of female priests to get invitations to these clergymans’ wives’ association functions. Julia Aurelius was keen on missionary work and willingly participated in such activities. She was one of the few women who wrote for the diocese Christmas book and she in 1932 wrote an article on “Herrnhutmissionens 200-årsjubileum. Firat i Herrnhut den 20-22 augusti 1932”, amongst other things. The article is a travelogue depicting an image of not only the history of Moravian tradition but also its importance to the Swedish Church. Julia Aurelius is not well-known as a frequent writer but she had a talent for watercolours and had, as a young child, attended a course run by the artist Fuchs. Julia and her husband Erik had a family consisting of their sons Sam and Bengt Gustaf Aurelius, both of whom went on to become priests. Sam Aurelius went on to marry Karin, and their son Carl Axel Aurelius was the bishop of Gothenburg diocese from 2003-2011, while Bengt Gustaf Aurelius and his wife Gudrun’s son, Erik Aurelius, was the bishop of Skara diocese from 2004-2012. Both of Julia Aurelius’ grandchildren fondly remember her warmth, enthusiasm and her courage, despite her shyness. An example of the above is seen in the story that Bengt Gustaf tells of his mother’s experience during the Second World War when Hitler came to power. She was fiercely critical of this and could not remain inactive. She made contact with several German Jews who had arrived in Sweden as refugees and supported them with practical assistance. Her husband Erik Aurelius died suddenly in 1935, en route to the opening of a cemetery. From 1963 onwards Julia Aurelius lived in Norrköping with her son Bengt Gustaf and his wife Gudrun. Gudrun was a doctor and had her own surgery in the house. Julia Aurelius became an honorary member of Östgöta Nation (student body) in Lund, where her husband had been an honorary chair and her sons had been counsellors. Julia Aurelius died in March 1980, aged 93. Erik and Julia Aurelius are both buried at the Vreta Kloster church cemetery. Julia Louise Elisabet Aurelius, www.skbl.se/sv/artikel/JuliaAurelius, Svenskt kvinnobiografiskt lexikon (article by Ulrika Lagerlöf Nilsson), retrieved 2019-04-23.